The 10 Best Pizza Restaurants in Rhode Island! Looking for pizza by the slice, or maybe a nice sit-down spot? Whether you love New York-style pizza, pan-style or want something entirely unique, Rhode Island has the perfect pizza place for you. Here are the 10 best places to eat a fresh-from-the-oven pie in the Ocean State! Shepherd Ferry—who designed the Obama “Hope” posters—once lived above this pizza place. Rumor has it that Nice Slice allowed him to live upstairs for free if he helped to redesign the space. Even though the original location on Thayer Street closed in April, fans of their thin slices and plentiful vegan options can still check out their new location in West End. This served-by-the slice pizza is a favorite among Providence locals. A little-known fact? It’s also BYOB. Make sure to try some of their more creative concoctions, which include the steak and scallion pizza or the stuffed mushroom. This is a tiny little mom-and-pop style pizza place that’s best suited for takeout. Locals love their weekly specials and fresh ingredients. Not in the mood for pizza? Their calzones are incredible, too! Happen upon Cosmic Steak Pizza & Weiners and you’ll feel like you’ve hit gold in the middle of Warwick. You won’t be able to choose between a delicious steak sandwich or a piping hot pizza slice full of delicious melting cheese. Located in the heart of downtown, Providence Coal-Fired Pizza is the perfect place to warm up with a delicious pizza. One of their best pizzas is the clam pie, which uses fresh Rhode Island seafood. That coal fired taste gives their pizzas a unique feel like no other. This restaurant may be located in Federal Hill, but the pizza seems straight out of New York. With crunchy crust and soft dough and simple ingredients, this classic pizza is sure to please even the pickiest of eaters. The staff are also fantastic, and always willing to give a new recommendation. You can’t beat the Italian feel of Catanzaro’s. 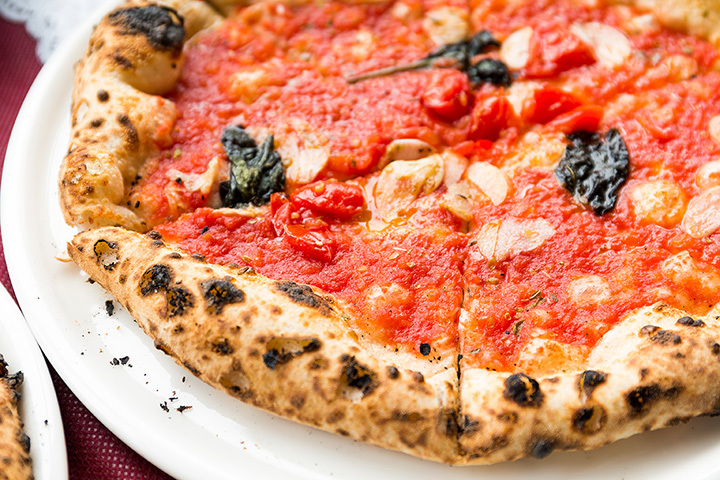 The pizza is pan-style, with a crisp bottom and deliciously flavorful top. Their classic cheese pizzas are almost as delicious as their white margherita! Give both a try. With a sophisticated, French-style interior, this intimate space is both romantic and lively. Take in all the delicious scents emanating from the mix of spices, seafood, and garlic. Their star pizza is delicious and simple, and a must have—you’ll love the tomato, mozzarella, arugula and prosciutto on top of every piece! Napolitano’s marinara sauce is like no other—it tastes like the kind of sauce your Italian grandmother would make. And the tastiness doesn’t end there—the restaurant uses fresh mozzarella and basil, which combine to make a flavorful and perfect New York-style pizza. Perfect for groups and families, Flatbread is a Providence favorite. With plenty of vegan and gluten-free options, those with allergies will be right at home. Try the Mopsy’s Kalua Pie, with pork, pineapple, barbeque and a perfectly salty crust.